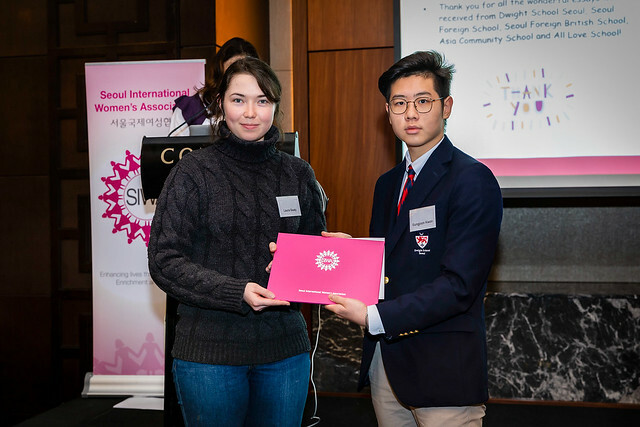 To celebrate International Women’s Day, SIWA invited students from our sponsor’s international schools and Korean schools that SIWA supports in two divisions, Junior and Senior, to submit essays addressing this year’s theme, #BalanceforBetter . Sungjoon (Anthony) Kwon from Dwight School submitted this winning essay in the Senior Division. He was awarded a certificate of recognition at SIWA’s March Coffee Morning where he read an excerpt from his essay. In addition, 500,000 KRW will be donated to his vetted charity of choice, AGIT & Anna’s House. During her freshman year at Stanford University, Debbie Sterling was humiliated in front of her class by her engineering professor when he asked the rest of the class if she should get a passing grade on an assignment. While she had spent dozens of hours working on her 3D design project, the rest of the class, consisting primarily of guys, didn’t seem to have put as much effort. Even though this was not the only time she was singled out as one of the few female students during her college years as an engineering student, Sterling persisted and is now a proud CEO of GoldieBlox, a toy company that aims to introduce principles of engineering to the younger generations of girls. Sterling’s experience is only one of the countless examples of the discrimination that often puts down women in the fields of STEM―Science, Technology, Engineering, and Math. However, despite the negative experiences during her education years, Sterling’s persistence and unwavering commitment have led her to become a kind of role model that girls aspiring to STEM-related jobs may look up to. According to Sterling, only 20% of undergraduate degrees in STEM are awarded to women in the United States. Simply because they are this outnumbered, women often find themselves in uncomfortable situations where they may not be taken as seriously, despite the movement toward equality among both sexes in workplaces. Due to male-dominated and often male-centric elements in decision-making processes, even fewer women go on to join STEM-related jobs. According to Small Business Trends, less than 20% of the STEM-related workforce are women, and of those who own technology startups, only 5 percent are women. Furthermore, only 12 percent of computer network architects, 13 percent of computer hardware engineers, and 19 percent of computer research scientists in the United States are women. Perhaps, it is not surprising to find that of the 607 people who have been awarded Nobel prizes in chemistry, physics, physiology or medicine until now, only 20―a mere 3.3%―are women. As popularly hypothesized, this may be because of the different upbringings of boys and girls in traditionally patriarchal societies. Naturally encouraged to play with dolls and playsets when young, girls may grow up thinking that it would be natural for them to engage in HEED―Health, Elementary Education, and Domestic―spheres or their related fields, a tendency that Professor Luigi Guiso and his colleagues term ‘social belongingness.’ According to Guiso’s research team, this is when someone thinks he or she belongs to a particular field because of its gender character, a perception often instilled due to popular social expectations. When it comes to choosing their career path, ​teenagers often feel that they would fit in better in areas ​befitting​ their own gender. ​On top of this, ‘self-efficacy,’ which Guiso and his colleagues define as “the belief that one can succeed in a domain,” also plays a role in leading girls to choose HEED over STEM, explaining the gender gap that exists even in so-called gender-neutral countries such as Norway and Sweden. In order to counter the problem of social belongingness, we need to more proactively deliver the message that it is unnatural for a job to be tied to a particular gender. Especially when it comes to STEM, women, as much as their counterparts, should find it acceptable to pursue their passion, rather than shy away from it because of the social expectations imposed on them. Promoting talks and seminars on such social platforms as TED which people are free to access at their own convenience may be a solution. But, organizing speaker events for younger audiences, such as kindergarten and elementary schools, or field trips to STEM-related companies and labs would have a wider reach, helping younger girls to familiarize themselves with social acceptance toward women working in STEM-related jobs. We can combat the problem of self-efficacy by introducing role models to female students, and by providing social incentives for women to join the STEM workforce. Role models can empower young girls to feel that they are just as capable, and do not need to succumb to societal expectations. Although relatively few, stories of ‘successful’ female scientist researchers or CEOs of technology companies may help to eliminate the doubt in girls that they are as mathematically or scientifically gifted as boys. Providing social incentives is also a great way to significantly increase the number of women in the fields of STEM, since financial incentives do not work in countries like the United States, Norway, and Finland. Studies show that in countries with gender ​in​equality, women take STEM professions as a way to make more money and find more freedom in the otherwise male-dominated society. However, the fact that financial incentives work in countries like Algeria, Turkey, and the United Arab Emirates, does not signify that they will also work in more gender-neutral countries. Because the aforementioned countries lack movement toward gender equality, joining the STEM workforce is often the only way out of the social and financial ceilings for more money, and thus, more freedom. In some cases, women are still paid much less than men, and are identified as the properties of their husbands, who often take control over their wives’ economic and social activities. However, studying and excelling in the fields of STEM will grant them independence, demonstrating financial incentives can only be a solution to the gender gap in special circumstances. On the other hand, because women in countries like the United States and Korea have alternatives that guarantee a certain level of living standards, simply providing them with a high pay may not win them over to the discriminatory workplaces. Social incentives, like awards and promotions, provide opportunities for women to earn recognition for their achievements, and will provide women with more motivation to join the STEM workforce. When compared to the magnitude of discrimination that women face in STEM workplaces, financial incentives simply may not be incentivizing enough. Thus, motivating women to pursue STEM by awarding them with recognition, autonomy and power will help attract them to the otherwise male-dominated jobs. The gender gap in STEM is a deep-rooted problem that can only be solved when tackled more collectively. Though providing fair pay may be a solution in developing countries, addressing unbalanced participation in more advanced countries requires a more nuanced approach. Some of the main problems that are preventing women from pursuing STEM are that women feel uncomfortable in workplaces dominated by men, that women do not feel that they belong in STEM due to the problems of social belongingness and self-efficacy, and that women in countries with gender equality have other interests. Therefore, in order to solve the gender gap in the fields of STEM in advanced countries like the United States, Norway and Korea, assuring girls of their capabilities as well as providing more social incentives would be a more proper approach. We can use role models as a way to intrigue the younger generations of girls and educate them, and give them more opportunities to earn recognition for their unwavering commitment to STEM. But eliminating the gender gap in STEM would require a more collaborative and collective approach in executing the proposed solutions.